Industrial structures such as manufacturing and warehousing facilities, shipping and storage terminals, and infrastructure components are typically constructed using reinforced concrete as a major component. Normal deterioration of the concrete, or construction deficiencies, or a requirement to upgrade a facility, can cause a need for repair and restoration of concrete, steel, expansion joints and other structural components. 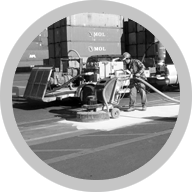 Procedures used include removal and replacement of deteriorated concrete, repair of cracked concrete by epoxy pressure injection, shotcrete, waterproofing, expansion joint installation or repair, floor leveling, repair of failed construction joints in warehouse floors.